If you’re looking for the Mirage Volcano times, eruption videos, as well as viewing tips, you’ve come to the right place. 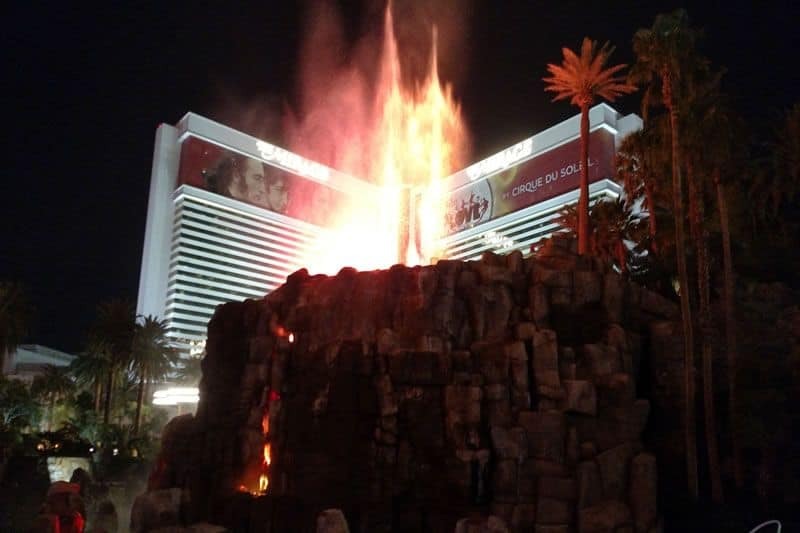 The Mirage Volcano show is one of the best free things to do in Las Vegas. 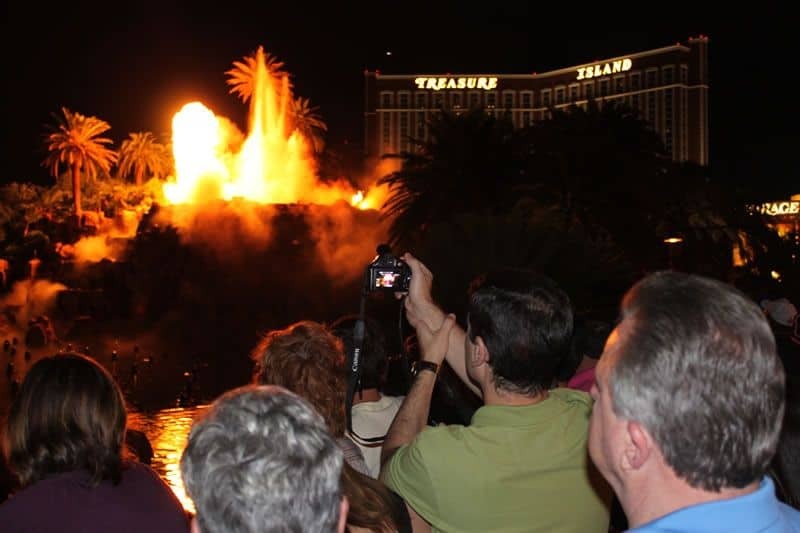 The volcano show schedule has been reduced dramatically since July 2015 from every half hour to only twice a night and three times a night on Friday and Saturday. The show lasts almost 5 minutes. If you see a flashing red light on top, this means the show has been cancelled (usually due to wind). While the Mirage Volcano times have been reduced in the last year, its still a spectacular site! 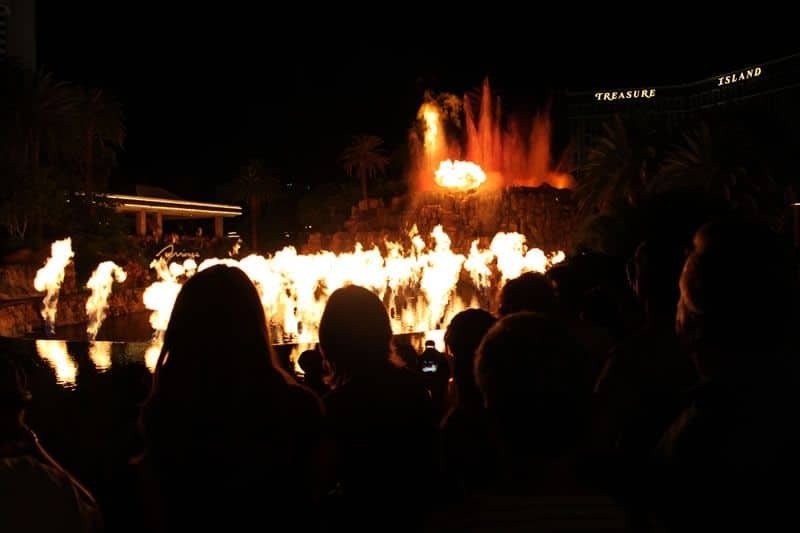 The Mirage Volcano show is an amazingly choreographed fire and music spectacular! It opened back in 1989, and was one of the hottest shows on the Strip – literally! The show was redesigned by the creators of the Bellagio Fountains, WET, and integrates the music of The Grateful Dead’s drummer Mickey Hart and Indian tabla player Zakir Hussain. 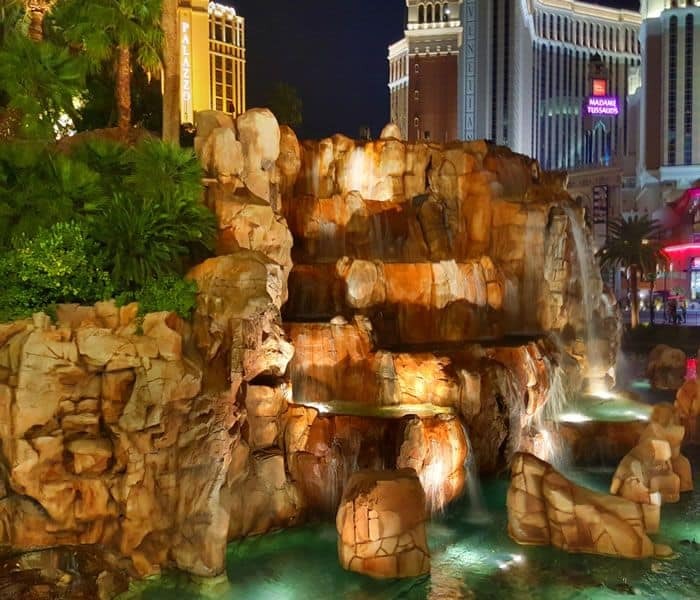 It transforms a serene 54 foot waterfall into a fiery lagoon with 150 fire shooters that launch 12 ft in the air, and two erupting volcanoes all set to percussion music and sound effects. You can feel the music and eruptions rumble the ground below your feet, and the heat from the fire is noticeable! 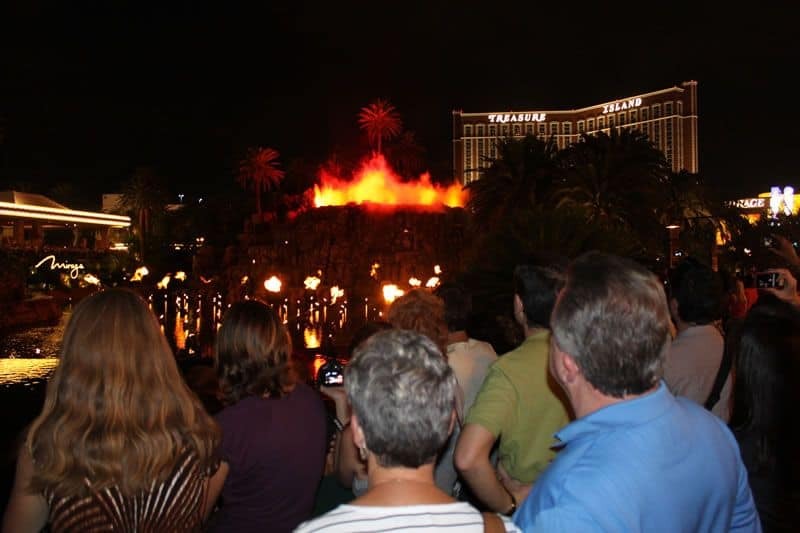 If you want to watch the Volcano from the Las Vegas Strip sidewalk, you’ll want to get there about 25-30 minutes early to get a front row spot on the railing. Even after you think you’ve managed to find a primo spot…others will push you to get in front of you, or stick their camera phone in front of you. So get there early, and stand your ground! If you book a Volcano View room from Mirage, you’ll spend about $10 more, but you’ll have a perfect view of the Volcano – without the crowds. 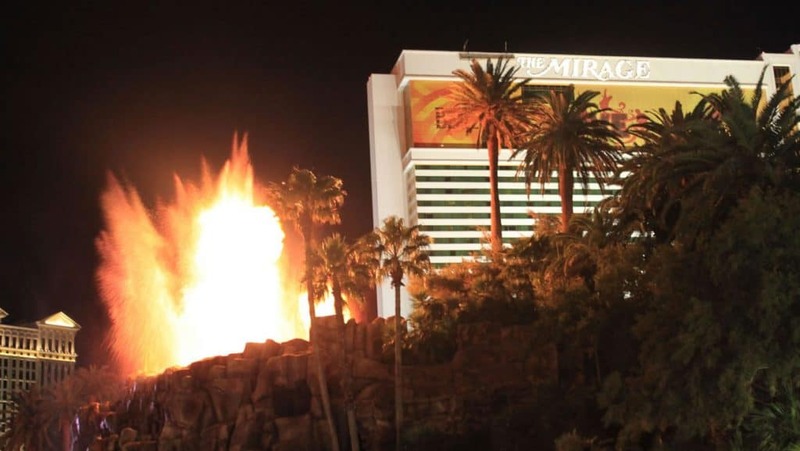 Most people don’t know the valet at the Mirage is actually a great place to see the Volcano, without as many crowds. Get there about 15 minutes early to secure a place on the wall. 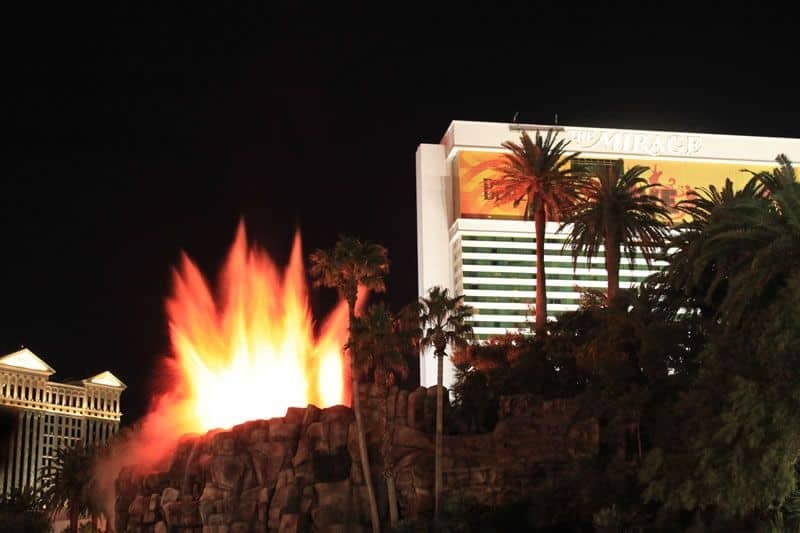 Across the Strip, Outback Steakhouse offers window seating for a perfect view of the Mirage Volcano. You can’t see that at your local Outback. Dinner and a show!